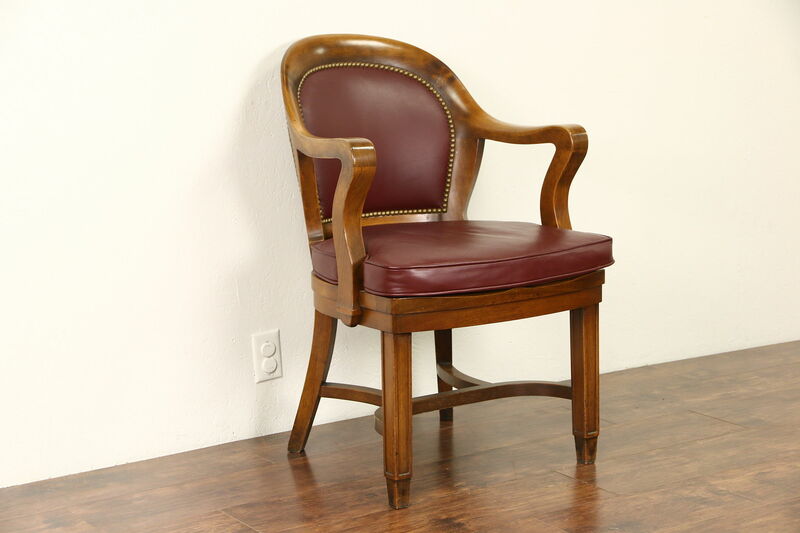 Signed "Clemco of Chicago" in the 1930's, this solid walnut desk armchair has recent faux leather upholstery in very fine condition with brass nailhead trim. The frame has a little flex but is still strong and has a fine finish with some mars and wear at the edges. Under the cushion is a cane seat with quite a bit of wear to the finish. Measurements of this vintage library or office furniture are 24" wide, 25" deep, 33" tall and the removable seat cushion is 19" high. A similar chair was upholstered in the same fabric and sold separately.